Lilac Coat and Purple Blouse | Is This Mutton? If you're a lilac lover, it's not always an easy colour to find, except in bridesmaid's and prom dresses, and occasionally sportswear. So I jumped on this lilac coat from Marks and Spencer when I saw it, even though I don't really need another coat. This one is a size 12 and I would advise sizing down, unless you like the big cocoon look. I prefer my coats a little more tailored. It feels very soft and luxurious, as if it has cashmere, but in fact it's 52% wool and 48% polyester. I'm wearing the coat with a purple blouse, also from Marks and Spencer; it has a drape shoulder detail which I was mistakenly wearing at the front. It's a detail I could have done without, as I would have preferred to wear a scarf or necklace (it's not a very flattering neckline on an over-45s woman) but with the shoulder detail, it would have looked over-the-top. I also wore my silver pleather pencil skirt and silver shoes, last seen here. Lilac goes especially well with grey and silver. My tights are silver lurex, which is a bit of fun. Below: look no hands! I had draped the coat over my shoulder but it looks as if I'm wearing it and my hands have disappeared. My hunger for purple is unassuaged; I found a couple of pieces in Marks and Spencer yesterday and I'm still looking for boots and a bag (let me know if you see something!). Coat, Marks and Spencer; blouse, Marks and Spencer; skirt, Next; shoes, Asos; tights, Gipsy. Join me on Thursday for the latest installment in the Birthstone of the Month series: the amethyst. It goes well with these colours! Hi Gail, I think that colour is great and suits you very well. The coat is so stylish but agree it's quite capacious! I have to be careful myself as even though I'm reasonably tall some coats look like dressing gowns on me! You have such a good eye for shoes - these silver shoes are just lovely. I might change it for a smaller size though I think it's supposed to be roomy. The silver shoes are lovely but sadly not "day shoes" - they're for special occasions with no walking! This looks so soft and luxurious Gail. I love the colour on you and it works so well with the silver. Thanks Laurie - it is very soft and cosy! It's a gorgeous colour Gail, perhaps the lighter lilac of the coat is more you, so pretty on you. I noted the silver shoes! Love the tights. You look stunning. But I guess this pretty coat didn't join you on your woolly meet up, sorry, mutton up in London! Hugs, x. It's a beautiful coat. M&S do do well with their styles don't they. You are so right. That silver skirt and shoes do go well with the lilac. Thanks Anna. I think (hope!) the coat will be timeless and last for years. It's not the sort of coat you wear very often but nice to have! I don't always mind having a coat or two that are bigger sized!! Then I can layer galore under them!! This color is so pretty on you, Gail!! I am looking for and finding more purple everywhere. Contemplating getting a pair of Poetic Licence booties with ultraviolet trim just so I can try the color out. My PC loves purple and would love your outfit. The purple and silver work beautifully paired together. Oops my comment of a few days ago has ethered itself, so I'll keep this one short. 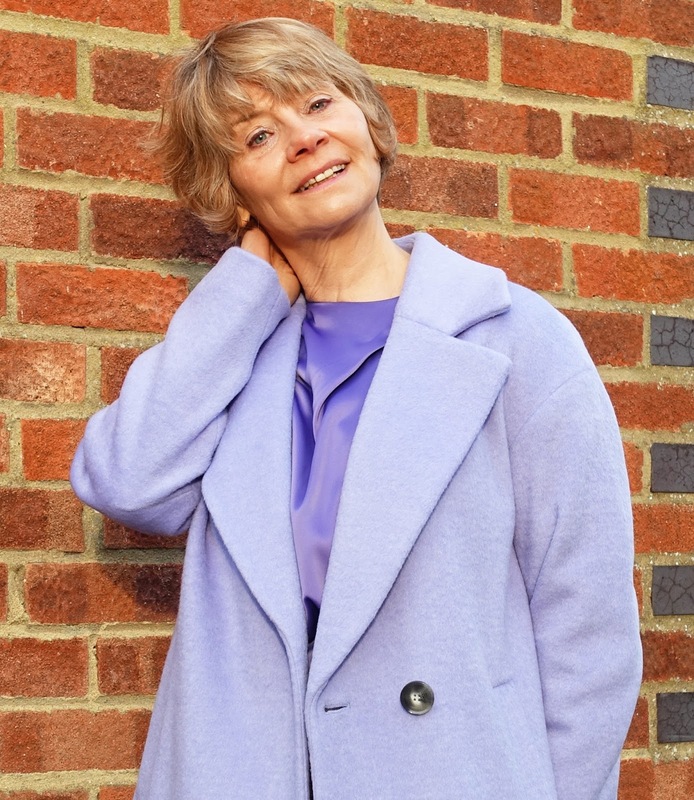 Looking lovely in lilac, Gail, and the colour does suit you. Hugs, x. Beautiful coat Gail! Quite an unusual colour too - I'm surprised we're not seeing more purple and lilac filter through to the high street yet. Combining it with the metallic skirt and shoes looks lovely. Thanks for linking up!